Recommended recreation near the Slocan Valley Rail Trail. Address: 701 Lakeside Drive, Nelson B.C. 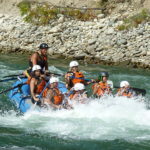 Nelson Whitewater Rafting Co. offers fun, family friendly whitewater rafting trips down the Facchina Rapids section of the Slocan River. Gentle scenic float trips are also offered and are appropriate for all ages. Transportation is provided from the Prestige Lakeside Resort in Nelson. NWRC staff are known for their focus on safety, fun and professionalism. Just a 45 minute drive from Nelson or Castlegar, through the beautiful Slocan Valley on Highway 6, finds you at the picturesque Valley View Golf Course. After your round enjoy delicious food in our licensed restaurant with its inviting wrap-around deck overlooking the course. The friendly and relaxed atmosphere will make you want to return again and again. It’s a nine hole course with separate tees for the back nine. The course contains sand traps and some water hazards and offers rewarding enjoyment for golfers of any calibre. Come out for Senior’s Mornings on Mondays, Junior Nights on Mondays after 4pm, and Lady’s Nights on Wednesdays.. Juniors lessons are offered during the summer months through Slocan Valley Recreation Commission. Tuesdays are half price golf all day, and Fridays are half price golf after 2pm. Follow your Friday afternoon golf with Wing Night on the Patio. Please visit golfvalleyview.ca for more information or phone 250-226-7241.